“On behalf of Illinois corn farmers, the ICGA is incredibly thankful to President Trump for carrying out his promise to us by directing the EPA to issue the RVP (Reid Vapor Pressure) waiver for blends up to and including E1510. The president’s action isn’t just a win for corn farmers and the ethanol industry, motorists everywhere will now be able to fuel up at the pump year-round with E15, a clean, high-powered fuel that helps clear the air of toxic tailpipe emissions and lowers prices at the pump. URBANA — Researchers at the University of Illinois have developed a new method that outperforms the crop yield estimates provided in the USDA World Agricultural Supply and Demand Estimates, considered by many the gold standard of crop yield projections. 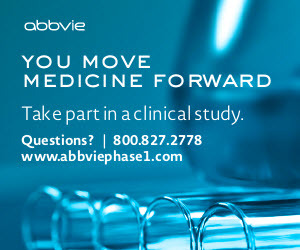 The new method, developed by Kaiyu Guan and Bin Peng, outperforms the WASDE projection model in a scientifically rigorous and reproducible way, according to a U of I news release. Compared with using historical climate information for the unknown future, which is what most previous research is based on, using seasonal climate projections from the NOAA’s National Center for Environmental Prediction provided more accurate predictions, added Peng, the lead author of the U of I study and research associate. Guan and Peng point to the fact that between 2010 and 2016, the WASDE June report was off, on average, by 17.66 bushels per acre. The researcher’s method, however, proved to be off by only 12.75 bu./acre. The pattern is repeated in other months, as well. SPRINGFIELD — Speaking of crop production projections, here are some highlights from the Oct. 11 USDA National Agricultural Statistics Service Illinois Crop Production report: Corn planted area, at 11 million acres, is down 2 percent from last year, while harvested area, at 10.85 million acres, is down 1 percent from 2017. The Illinois corn yield is forecast at 212 bushels per acre, down two bushels from the (controversial) NASS September report, but up 11 bu./acre over 2017. The NASS corn production estimate of 2.3 billion bushels, if realized, would be the second-highest production on record in Illinois. Soybean planted area in Illinois is estimated at 10.8 million acres, up 2 percent from last year, while harvested area, at 10.75 million acres, is up 2 percent. The Illinois soybean yield is projected at a record high 66 bu./acre, up eight bushels from 2017, while production, at 710 million bushels, is up 16 percent and would be the highest production level on record, according to the report. According to the Oct. 9 USDA-NASS Illinois Crop Progress and Condition report, corn harvested was at 63 percent, compared with the five-year average of 41 percent. Soybeans were 51 percent harvested, compared to 49 percent last year. 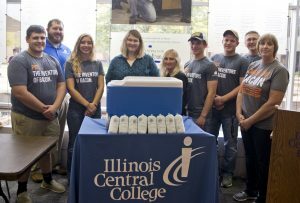 EAST PEORIA — The Illinois Pork Producers Association partnered with the Illinois Central College agriculture program to donate 100 pounds of ground pork to the ICC food pantry, where their fellow students can enjoy the benefits of protein-rich pork. Professor Grant Grebner’s animal science class at ICC and the ICC Agri-Business Club collected donations from students — which were matched by the IPPA Pork Power program — to purchase the pork from Chenoa Locker. “We realize there are many college students who are struggling to make ends meet. May students hold a job, or jobs, trying to support their families,” Grebner said in an Oct.12 IPPA news release.